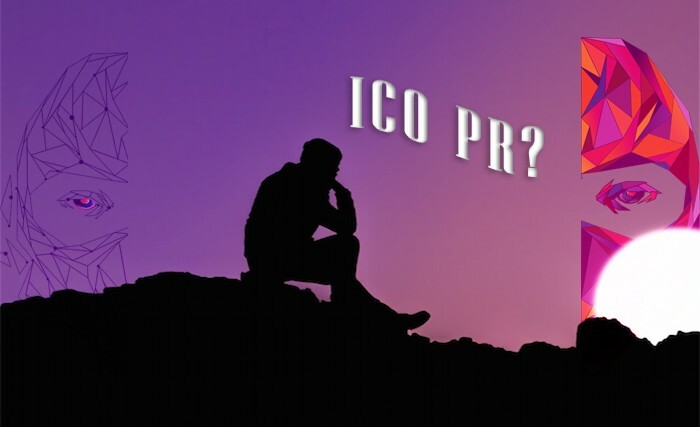 PR is a key element in the success of any business, and ICO is no exception. Quite the opposite — for blockchain project PR is essential so that it has a better chance at reaching the right audience. It allows for showing the best of your idea from the point of view of others. As NinjaPromo stressed countless times before (especially in our previous piece), word of mouth is the best marketing tool available to everyone. And drawing independent media to do some heavy lifting for you is a good start. So let’s take a look at some of the best directions of PR-strategy for ICOs that we’ve observed and implemented. What’s the deal with ICO PR? Also, you should make it in time for tight ICO deadlines. But why would you even care for more traditional PR, when you have loyal community and social networks to deliver your message? First, you get an independent opinion. Publications on third-party platforms with certain level of credibility would show your project as worthy of attention and trust. Second, you get to use someone else’s popularity to your benefit. Major media platform or a well-known adviser for your project drag at least some audience to you as well. Third, every serious startup has the About Us or Press section where they can show off all the third-party publications that talk about it. The more crypto- and business-related media you have there, the better your project looks. Last, but not least — PR is a way of communication, as well as expanding your audience. It’s always beneficial to show your following that they are supported by major outlets. Also, it’s a good way to impress your potential investors by sending them links to your publications in, for instance, Forbes or Business Insider. Rushing into the PR with no plan or a vague list of things to do is a terrible idea. At best you’ll end up spending money on no results. At worst, such lack of professional attitude will make your existing audience and investors to reject your project and leave. “Look, your idea is great! But I don’t think you have what it takes to get it done…” — don’t be surprised with such break-up if you don’t plan for your marketing. A good first step would be to sit down with your team and figure out your PR strategy. It’s often based on the general concept of the project, deadlines for its milestones, the personality of its main representative, etc. Then, depending on the nature of the ICO, you figure out the content-plan that contains potential topics, exemplary titles and target media for publications. After you decide on your strategy comes its implementation. Your copywriter creates the planned texts, and you PR-manager sends them round the various media. Aside from that, you make good use of a Medium blog, follow you SMM strategy and turn to influencers for spotlight all steps of your development (if you don’t know how to approach opinion leaders, we have an influencer marketing manual for blockchain projects). In addition, you should communicate with crypto-events’ organizers for the future participation in conferences. During token sales your marketing should show how awesome your product is, how amazing your team is and (probably most importantly) prove that your ICO is not another scam. Each message is your PR campaign should at least one of those goals. Separate PR for your product and for your ICO, determining the target audience for each direction. ICO target audience should be based, among other things, on the latest data for its best regions. Product target audience should depend on the field’s popularity in the regions and the number of potential customers. According to experts, the optimal balance of topics for publications is 70% buy signals and 30% technology. The optimal balance between the media is 30% business, 70% blockchain. Plus, around 10% of publications should be places in top tier media (Forbes, Cointelegraph, Business Insider and alike). It also would be a good idea to add professional (related to the specific field of your project) media to your wish list. 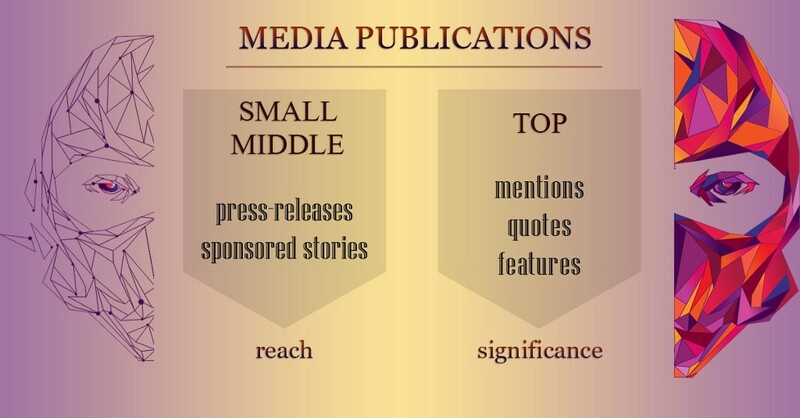 PR strategy should include 2–3 creative news topics for media pitching in order to get free publications. It would also help if your strategy contained at least some of the prices in your content plan — for example, in those cases where the topic is strictly required (like “The ICO launches in a week”). Small and middle tier media provide publications for certain prices which are usually lower for ICO marketing agencies (since they work with a number of clients, they can get a bulk discount). For those outlets there are only 2 useful formats of publications. Press-releases are best suited for interviews and various announcements, from pre-ICO launch to new partnerships. Sponsored stories are supposedly written by the outlet itself, thus they are seen as more preferable in some cases. However, in our experience it’s much better to create those articles yourself as well. features (the article is dedicated to your project). Feature is obviously more expensive than a mention and a quote that are within the same price range. It might take a columnist up to 5 weeks to release their publication since they had to receive an approval from their editors. Ideally, for your PR strategy you should combine all those features. And budget restraints are not the only reason. Smaller channels often provide reach to narrower audience while bigger once add weight and prominence to your project. People from your team give knowledge about your project that no one else possesses, and professionals from ICO PR agencies can show you the most efficient way. At the end of the day, a through-out well-rounded campaign that utilizes all the tools at hand without dismissing the “irrelevant ones” is the campaign for the win. Major Steps of ICO PR-campaign was originally published in Data Driven Investor on Medium, where people are continuing the conversation by highlighting and responding to this story.